Nothing makes clearer the broken promises of Bowers Rock State Park than one little notice on the array of signs at the park entrance, an entrance from which nearby land owners evidently want the public barred. The notice is from the National Park Service of the U.S. Department of Interior. 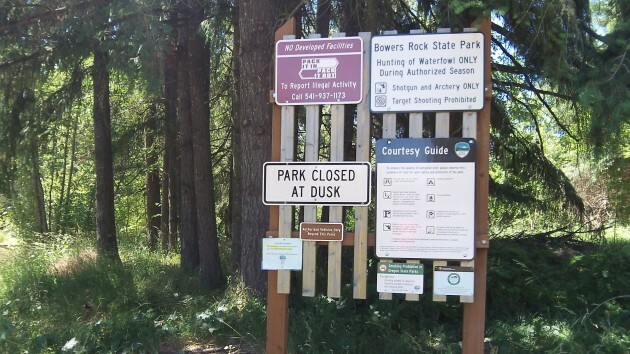 It says Bowers Rock benefited from a federal program intended to “provide outdoor recreation and open spaces for all.” If the feds took a look now, they might want their money back. Planning for Bowers Rock began more than 42 years ago, about the time the state acquired the site in line with a legislative mandate. It was in December 1973 that the state parks and recreation staff compiled proposals for a master plan for the 893-acre area so it could meet its stated purpose, which was to meet the “regional recreation needs” of the Albany-Corvallis area while also preserving its “natural values for future generations. The plan proposed an entrance from Bryant Drive at the southeast corner of the park, not Bryant Way at the northeast corner. It showed a road leading to four or five parking areas, various picnic spots, a system of trails, pond improvements for warm-water fishing, a service yard and park manager’s residence, and a boat ramp on the Willamette. None of it exists, public access remains in doubt and now is even met by veiled threats. If there is Recorded easement, how are property owners on that road able to deny access? Or is the sign the product of no actual place to park on the public land once you get to the “public park”? Notwithstanding the parking issue, does the public’s’ right of access to a Fed/State designated public space trump the private-road restrictions? Thank you HH for the look at the end of the lane. I’ve wondered about this “park”. Interesting pictures! I suggest a short video tour if you dare to ride down there again! Shotgun and bow hunting allowed in season. Yikes! Good thing the general public isn’t tracking around. After reading this thought provoking post, I remembered a story in the paper titled: Bowers Rock: Oregon state parks’ hidden gem. So hidden it is not accessible without threat. No doubt folks on that lane have called the sheriff from time to time out of fear or whatever. HH, hope you didn’t need a new set of tires for your bike after rolling down and back over that rough lane terrain! That’s what mountain bikes are for. So is it legal to ride a bike there? I have tried to find the entrance several times and always failed. Is there a map or directions anywhere? You can find a map by rooting around online. But it appears there are different interpretations of this easement. 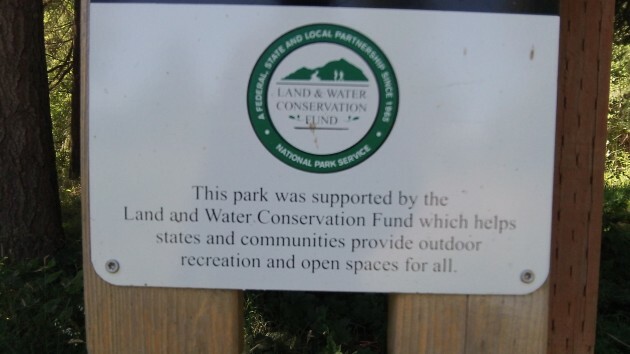 Is it for the state only — so they can maintain the park for those who access it via the river? Or does the easement extend to the general public? Generally speaking, adjacent property owners have no right to deny access to a land-locked parcel. They do have a right to be compensated to provide a permanent means of access. If that can’t be done through negotiation, then a case can be filed in court to establish a path of access. The judge would then determine the fair market value for compensation. No no one likes a fight between property owners. The state probably does not have the money to proceed with development these days, so they’re not going to stir up the neighbors at this point. The Linn County Commissioners said they’d like it, but they haven’t done a thing even though its in their jurisdiction (no surprise there, they only file lawsuits against the state). I remember Andy Olson had a bill at one time to protect the adjacent property owners by gutting state authority to get access for the public, so he’s no help. So who “owns” the access route? Who are those adjacent land owners? Bob, as long as the State owns it, any money spent “fixing” it by the County would be wasted tax money. I’m sure that the Feds will use their power of eminent domain if they ever truly want to. Thank you for all your local stories of interest. Now I am going back to my weak memory. As I recall there was a sand & gravel operation some where down that road. If there was a commercial operation I´d think right-of-way is not the issue. Vandalism & other crimes that most likely happen there is the problem. Think back to the stories that have happened just across the river at Hyak Park. Also at issues from the closed Truax Island park area. Hasso had done a story the summer of 2013. What is a solution ? I don´t have one. Until it can be properly made a park for all to use and enjoy we best leave things as they are now. As the former land owner who owned the property to the right of Bryant Way, I believe I know all the facts about the road. It is true that 5th Avenue had a sand and gravel operation on the now state land and the road was paved. However after they quit mining we received a letter from Linn Count road dept stating they would no longer maintain the road. I talked to them and they said the county doesn’t own it and you can’t prove we do. At that time I had a quit claim deed from the original owners of the land to the county but they said they never accepted title to the property. I then contacted the assessors office and in his immortal words “when we find out who owns it were going to assess them”. To say I was unhappy is an understatement but then the state bought the land behind and announced Bowers Rock state park and I laughed. At no time has the state had an easement. All they have is whatever rights they received when they bought the land from Kleinke. 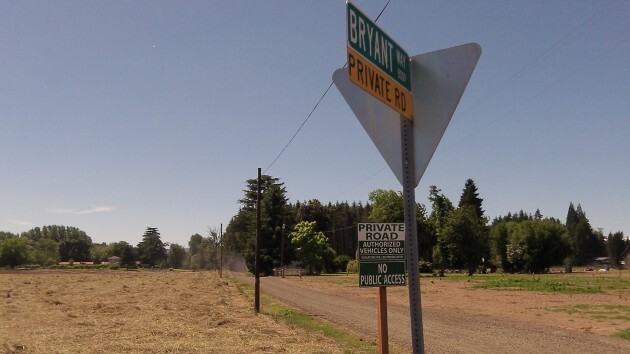 Furthermore the original easement was only 30 feet of which 15 feet came from Swink who previously owned my parcel and 15 feet from Bryant who adjoined the other side of the road. And that Bob Woods and Ray K is why everybody dislikes the government. Because they buy park land?. I don’t think so Al. People love their parks, and they’re glad that they can use them, and that they’re open to all. Many interesting quotes in paper article from Dec 2014. Link above. Everybody! Get your canoes out!